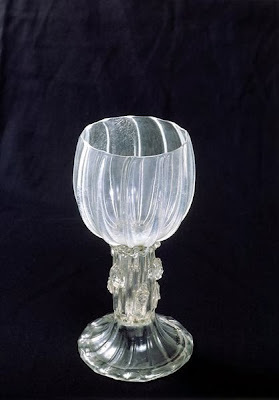 "To work lead glass into various drinking glasses or other vessels, or even to draw cane for beadmaking, it is necessary to raise the punty [out of the melt], and to make a gather of glass by turning. Take it out, let it cool somewhat and then work it on a well-cleaned marble [marver]. The marble should be somewhat cool, and well bathed with water before use." He goes on to describe what might be termed a kind of dance with the glass. As with a human partner, gentle patience is required in learning the boundaries of what can and cannot be done. Ultimately, an artist must come to understand the material's behavior and personality in order to result in a great partnership. For the artist who makes unrealistic demands, glass can be a heartbreaker. 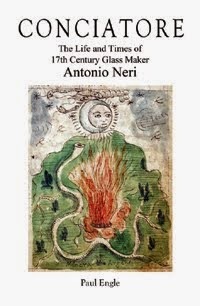 "This sort of glass, lead glass, is so runny that were it not cooled, and taken up by turning [the punty] to wind a gather, it would be impossible to work. It is so runny that it would not even hold onto the punty, because it is as loose as soup. This arises out of [the fact that] the lead calx causes it to become very fluid." "Namely, gather the glass little by little, allow it to cool, and work it over marble frequently bathed in water. Furthermore, make sure to keep the pot of glass rather calm, and in a place in the furnace where it will not see too much heat, otherwise it will not be possible to work this glass at all." The formulation of lead crystal as we know it is a relatively recent development. This is a composition of crushed silica (sand or quartz), potash (potassium carbonates) and lead oxide substituting for calcium to stabilize the composition. It is also true that lead has been added to glass since its invention a few thousand years ago. It is not clear that this addition was always intentional, but a Babylonian tablet of 1700 BCE gives a recipe for pottery glaze that explicitly contains lead. At some point, a discovery showed that small amounts of lead and pigment smeared on glass and fired made stained glass paintings possible. The earliest known examples of colored stained glass windows date to 800-820 (San Vicenzo Abbey excavation in Volturno, Italy.) In medieval Europe, leading up to Antonio Neri's time, lead glass was used in mosaic tesserae and in artificial gems. Finally, it is worth noting that Neri's childhood church in Florence, Cestello (now called Santa Maria Maddalena dei Pazzi), was then run by Cistercian monks. It was the Cistercian luminary St. Bernard of Clairvaux who, in the twelfth century, built the first church with large windows, urging, "The soul shall seek the light by following the light." This post first appeared here 15 November 2013.